1. He gave us Pascal Dupuis- Ok, well maybe he didn't personally get us Dupuis, but we would not have Dupuis had it not been for the Hossa trade. Dupuis is not only a strong locker room personality, but has really picked up his scoring input recently. I would say he was the value of that entire deal. 2. Pens didn't lose that much- I will say that I have both an Armstrong and a Christensen jersey in my closet and they were always two of my favorites, but the truth is that they just havn't been producing like they used to. Armstrong has taken on the grinder role with Atlanta, and while he is effective at that, he hasn't been the impact forward the Thrashers had originally hoped for. Christensen is currently on his third team since the trade (ATL to ANA now with NYR) and has taken a similar role as a shootout specialist with all of them. Prospect Angelo Esposito, drafted in the 1st round in 2007 by the Pens, also hasn't panned out all that well, at least not yet. He has struggled with injuries and managed little success in professional hockey. 3. Saved a lot of money- As much as Pens fans wanted Hossa to stay, the truth was that they just couldn't afford him anyway. In order to give Hossa the years and money he wanted, they would have had to use essentially the rest of the already tight stretched salary cap. 4. Won the Pens a cup in 2009- Ok, maybe he didn't mean to, but his lackadaisical play in the 2009 finals took a vital presence away from the Red Wings, and meant one less threat against the Pens. I know it is a pretty weak reason, but at least it isn't a reason to dislike him any more. 5. He's gotta beat the Flyers! Hossa along with teammates Patrick Kane and Jonathan Toews will lead the Blackhawks into the 2010 finals against the Philadelphia Flyers. 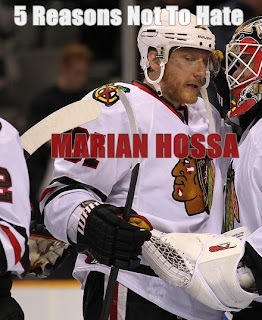 So, at least for the next few weeks, all of my previous grievances against Hossa will be put on the back burner as he will be vital in order to take out the Flyers and preserve the sanity of the rest of the NHL. Go Hawks.